description: The Eiffel Tower looms in the background as an arena cheers wildly as the monster truck Bigfoot crushes various smaller vehicles. After the show, the driver, Clark Oswald, congratulates himself in the mirror. He is admiring his biceps when his manager, Rene Cartier enters. Rene hopes Clark is adjusting well to France - Clark, however, is haunted by the memory of the tragic death of his wife and son due to Bigfoot, which is what drove him to France, but not away from monster trucks. Rene's daughter Josie bursts into the locker room, anxious to be introduced to Clark. There is some brief confusion as to her age and gender. Later, Rene is quietly feeding the birds outside the Louvre when two men approach him. They introduce themselves as Pierre and Juan, and inform him that they have a proposition for him: they would like to challenge Bigfoot in a match to the death. They believe their trucks, Le Poisson and the Santa Maria, respectively, can defeat the heretofore unbeatable Bigfoot. Rene sees only the opportunity to hike up ticket prices, and agrees. Clark is attempting to eat a hamburger in his tiny studio when Rene knocks. The manager informs Clark of the deal he has just made on his behalf, and Clark agrees to the terms and vows that it will be to the death. Josie bounds into the apartment and presents Clark with a dream catcher she made for him out of her father's cigarette butts. Clark finally asks point blank and she reveals that she is twenty-one. The next day, at the arena, Pierre and Juan are waiting for Clark. An impromptu challenge occurs and Rene rushes in and stops the three before they can destroy each other - at least before the official death match. Josie is waiting for Clark in the parking lot. 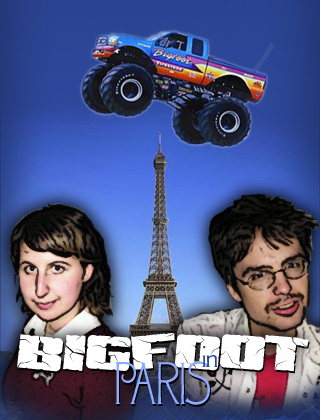 She asks him to teach her how to drive Bigfoot, as she hates Paris and needs a way out. Clark, again haunted by his son's death, refuses. She takes matters into her own hands and turns the key, taking them on a joyride through Paris. They end up at the top of the Eiffel Tower, where they share a picnic and a kiss. The next morning, they are interrupted at Clark's apartment by Rene's knocking. Josie hides in the Murphy bed, but Clark quickly confesses that he is indeed in love with his manager's daughter. Rene begrudgingly gives his blessing. Meanwhile, at the garage, a mechanic and his assistant inform Juan and Pierre that they have done as they were asked - Bigfoot has been sabotaged in its tires, in the engine, and in the radio. Juan and Pierre look forward to their impending victory. In his locker room, Josie and Clark prepare for the death match, and he remembers once again the loss of his wife and son. Clark readies Josie for the possibility of his own death. Rene tells them it is time to go, and Clark enters the arena. The death match begins with Bigfoot at a distinct advantage, but the Santa Maria and Le Poisson soon begin to unveil all their hidden tricks. Just as the timer goes off and all of Bigfoot's tires explode, Josie discovers the plans to sabotage the match. As Wham! begins to blare uncontrollably from Bigfoot, she immediately drives into the arena in a mini Cooper, helping to take out the Santa Maria. Clark finishes the job himself. He then turns his attention to Le Poisson, and overcomes it with relative ease. Josie joins him as he stands in the middle of the arena, victorious. Having proven himself in Paris, Clark is finally ready to let go of his painful past and begin a new life. He and Josie marry in matching driving jackets before their respective monster trucks. Clark's first family was killed when his son caused the giant Truckasaurus (which the kid was driving) to fall onto Clark's wife, killing them both. Le Poisson was a car shaped like a giant fish (painted in the pointlism sytle) and the Santa Maria was actually a retrofitted Spanish Galleon.